The automotive graveyard is filled with attempts to capture women buyers. Some are tacky, others are just called the Volkswagen Eos and capture that market on their own. That's not stopping Mitsubishi Fuso from trying to bring more women into the commercial truck market with the new Canter Eco Hybrid Canna concept. Of course, it's pink. 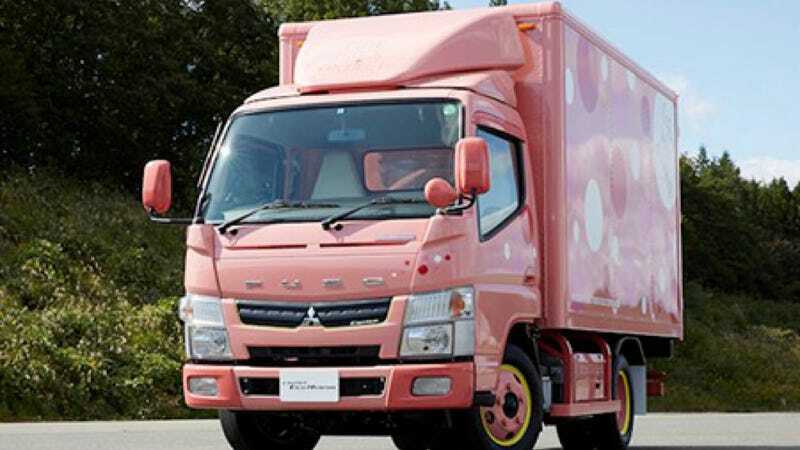 Even though there were apparently 9 women on the planning team, the theme of the Canna concept is "cute" and "comfort," because that's what Fuso thinks is going to get more women into the commercial truck industry. We get that they've tried to make it cute, but how is it more comfortable? Color-coordinated plastic mirror caps don't scream comfort and a white interior makes me think it's harder to clean. So, no, not comfortable at all. The yellow on the tires is at least interesting, though. Still, this probably isn't the way to sell women on the idea they suddenly need a commercial truck because it's painted like a prop from a children's TV show. Perhaps they should just ask VW instead of reading archival data about the Dodge La Femme.